Yeah, yeah, yeah. I know. I've been remiss. I get it. Sometimes things overwhelm me and I hide. For better or worse, I think I've got a better handle on it, and I can come back out. A bit. I'm not gonna kill myself to post a picture a day here. There'll be one a couple times a week. Ish. 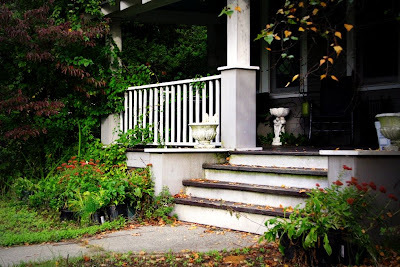 For today, you get the very front of my house...the changing and fallen leaves...the weeds...the potted plants the neighbor gave me that I never got planted...the mum-less planters on the side of the steps. The picture is a little sad to me, but it is what it is. Love the steps Bettye - especially with the leaves. Clever title. I appreciate your humour. About time we had a new photo to look out Miss B! Yay! Tree dandruff! Looks homey to me. I can't stand obsessive neatness. God put it there, I figger, and He'll take it away!